Over last offseason, the Texas Rangers organization challenged Curtis Terry to become a better overall hitter and fielder and assigned him to the Spokane Indians to repeat short-season Class A. He accomplished both with flying colors. 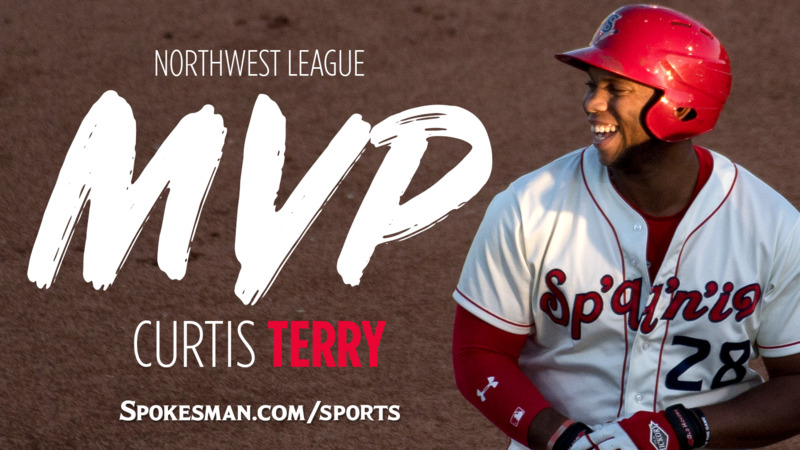 On Thursday, Terry was named Northwest League Most Valuable Player and first-team first base on its year-end all-star team. Terry, 21, leads the league in home runs (15), RBIs (56), total bases (143) and slugging (.616). His RBI total is 16 more than his closest competitor with five games to play. Terry is hitting .336 with a .430 on-base percentage, both second in the league to teammate Diosbel Arias (.372/.459/.493), who was named first-team shortstop on the year-end all-star team. Terry led the NWL in home runs with 12 last season and hit .258/.303/.467 with 30 RBIs. “(Terry)’s had a tremendous year here after a terrific year last year,” Paul Kruger, the Rangers’ assistant director for player development, said earlier this month. While players don’t strive to repeat a minor league level, Kruger said it was all about where the organization could find regular playing time for Terry this year. “Once (Terry) gets an opportunity to go into a full-season (league) he’s going to continue what he’s doing. But I think No. 1 and most important, as we tell all of our guys throughout the system, is where can you benefit yourself the most? And that’s playing. Vancouver pitcher Josh Winckowski was named pitcher of the year and Hillboro manager Shawn Roof was named manager of the year. The rest of the first-team all-stars were catcher Joey Bart (Salem-Keizer), 2B Kyle McPherson (S-K), 3B Bobby Honeyman (Everett), OF Luke Morgan (Boise), OF Diego Rincones (S-K), OF Otto Lopez (Van), DH Andy Yerzy (Hill), P Josh Green (Hill), P Brailyn Marquez (Eugene), P Jordan Guerrero (Tri-City) and P Matt Tabor (Hill). Published: Aug. 30, 2018, 4:10 p.m.